Founded with a vision to prepare students for a globalized future, Seattle's John Stanford International School (JSIS) is an internationally themed, model public elementary school. Several key strategies and best practices interact to help explain the success of JSIS. Since the school opened in 2000, the percentage of students passing all four state tests has grown approximately 90 percent and they are outperforming state averages in each of the four subjects tested. 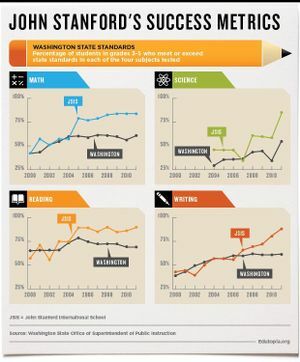 Their success has also been replicable: There are now seven international schools in Seattle Public Schools (an eighth will open in fall 2013), and in six of the seven, students outperform district comparison groups on state tests. Foreign-language-immersion schools can be defined broadly as those in which students spend at least 50 percent of their time learning while immersed in a nonnative language (Lenker and Rhodes, 2007). Foreign-language-immersion schools were first introduced in the United States in 1971 as a way to provide second-language education in elementary schools (Lenker and Rhodes, 2007). In 1985, only 50 foreign-language-immersion schools existed in the United States, and as of 2011 that number has grown to 448 (Center for Applied Linguistics (PDF), 2011). JSIS's curriculum (PDF) involves learning not just a second language but also about different cultures. This emphasis on global competency was inspired by a book that articulates key curricular components (PDF) of the Asia Society's International Studies Schools Network (ISSN). The ISSN includes 34 schools that integrate global perspectives and give students the opportunity to study one or more world languages. Across the Asia Society's ISSN network, which predominantly serves students from economically disadvantaged, high-minority, and urban backgrounds, approximately 92 percent of students graduate from high school on time, and among those, more than 90 percent go on to college (Wiley, 2012). Research suggests that learning languages at earlier ages and over longer periods of time supports second-language acquisition (Tochon, 2009). According to a meta-analysis of 63 studies, bilingualism produces a range of benefits, including increased ability to control attention and keep information in memory, better awareness of language structure and vocabulary, and improved skills in creative thinking and problem solving (Adesope, Lavin, Thompson, and Ungerleider, 2010). Bilingual students also attain higher levels of achievement on standardized tests in reading, writing, social studies, and math, and report higher levels of self-confidence (Tochon, 2009). Students in "50-50" language-immersion schools, in which students spend half of their day learning in a nonnative language, perform as well as, or better than, students in monolingual schools on standardized tests, and these benefits extend to English-language learners as well as native English speakers (Gómez, Freeman, and Freeman, 2005; Palmer, 2009; Thomas and Collier, 2002). At JSIS, students spend half of their day learning in Spanish or Japanese and half of the day learning in English. From kindergarten through second grade, students learn math and science while immersed in their second language. Because math and science concepts tend to be more concrete, they can be communicated more readily through hands-on activities, which help students in developing language proficiency and conceptual understanding. Hands-on activities have been shown to promote science learning at all levels (Bredderman, 1983), and possibly math learning in kindergarten and first grade, when relatively simple objects are used to focus students' attention on math concepts (McNeil and Jarvin, 2009). As students develop dual-language proficiency around third grade, they also receive reading, writing, and social studies instruction in their second language. Importantly, language-immersion classes are supported with instructional assistants who are native speakers of the immersion language and who can share knowledge of cultural traditions that support students' understanding of global perspectives. According to faculty at JSIS, full-time, native-speaking teachers and instructional assistants in immersion classrooms play an important role in the success of the international school model, particularly in the younger grades. Funding instructional assistants is a constant challenge for the school and the district, and instructional assistants may only be available part-time in upper-grade-level immersion classrooms. The school raises funds through donations made by local organizations, parents, and families. Investigate the world beyond one's own immediate environment, framing significant problems and conducting well-crafted and age-appropriate research. Recognize perspectives, others' and one's own, while articulating and explaining such perspectives thoughtfully and respectfully. Take action to improve conditions, viewing oneself as a player in the world and participating in the world reflectively. Teachers at JSIS use a rubric to infuse lesson plans with global competence. (See pp. 71-75 of Boix Mansilla and Jackson (PDF), 2011.) For example, in a fourth-grade unit about festivals of light celebrated around the world, students learn about world religions and then choose one festival to research, write about, and present in a visual way, demonstrating the global competencies of investigating the world, recognizing perspectives, and communicating ideas. JSIS also links global issues to local action through International Action Day, which recently focused on global access to water, and the Green Team, which encourages schoolwide actions to support environmental sustainability. The authors of Educating for Global Competence assert that in order to solve the earth's most pressing problems, both disciplinary and interdisciplinary knowledge are needed. Research also supports the efficacy of integrated curricula. Students who participate in integrated-studies classrooms are more engaged in learning and achieve test scores that are equivalent to, or better than, students in traditional, subject-specific classrooms (Vars and Beane, 2000). To support students in developing skills in communication and recognizing perspectives, all four of the district's international elementary schools implement two related research-based social and emotional learning curricula: Second Step (grades K-2) and Steps to Respect (grades 3-5). Both programs support students in developing impulse control and anger-management techniques, showing empathy, and solving problems. Several rigorous evaluations have shown that when implemented effectively, Second Step can increase cooperative behavior and reduce aggression in the classroom (Cooke, Ford, Levin, Bourke, Newell & Lapidus, 2007; Grossman, Neckerman, Koepsell, Liu, Asher, Beland, Frey & Rivara, 1997; Frey, Nolen, Van Schioack, Edstrom & Hirschstein, 2005; cited in Edutopia's Social and Emotional Learning Research Review). Perhaps one of the most critical aspects of JSIS's success is the professional learning community (PLC). Importantly, the PLC is facilitated by the school's and district's allocations of time and funding to support knowledge sharing and local teaching talent. Each summer, the district provides a "boot camp" for first-year immersion teachers around the state, in which they learn how to teach content and manage students in immersion classrooms. New immersion teachers model lessons and develop mentoring relationships with veteran immersion teachers. At JSIS, all teachers participate in weekly Wednesday meetings -- which rotate through grade-level meetings, subject-specific meetings, classroom visits (called peer observations), and book-study discussions -- and monthly PLC meetings. Teachers work together throughout the year to ensure that language and content are fully integrated. Pairing one content teacher with one language teacher, teacher teams develop thematic unit plans that cover one to several months of content. The school also raises funds for substitute teachers so teachers can have release time to participate in peer observations. During these visits, teachers sit in on each other's classrooms to observe and share successful practices and then "pick each other's brains" about the lessons. Teachers are also constantly working together to improve their curricula. According to former JSIS teacher Brent Hester, "Teachers are always looking back at student data to see where we need to meet the needs of our students, because every year our students are changing and so the needs that we need to meet are changing, as well." Teachers discuss and analyze student data such as test scores and achievement gaps, identifying areas in which students' needs aren't being adequately met and redesigning the curricula to meet those needs. At the core of effective collaboration is respect between the teachers at the school. "If another school is going to look at working collaboratively, the first piece is a group of teachers who are willing to work collaboratively and respect each other… All come to the table with different strengths, so recognize those and work together. Always approach work as a team effort, never a competition," says Hester. Last year, all staff, including language-immersion instructional assistants, participated in a book study of Educating for Global Competence: Preparing Our Youth to Engage in the World (PDF). The book study culminated with a 500-plus teacher/administrator symposium, in which teacher-leaders shared lesson plans and student work and received feedback to infuse more global perspectives into the lessons. Veronica Boix Mansilla, one of the authors, also attended as the keynote speaker and provided feedback and support to teachers. In addition to collaborating with district staff, higher education programs, and local and international organizations, JSIS regularly collaborates with families through parent-teacher-guardian conferences, and principal Jesely Alvarez has two-hour blocks of dedicated family time every Monday and Friday. To support these features, the district and the principal provide teachers with time to collaborate and funding for substitute teachers and training events. According to Alvarez, "Our vision is to create a culturally diverse community of lifelong learners who demonstrate advanced skills in communication, international language, and technology -- and whose performance exemplifies the highest academic standards." The PLC is the foundation for this vision. With a waiting list for JSIS every year, former JSIS principal and founder Karen Kodama is now working as the district's international-education administrator to increase access to international schools, as well as implement nationally recognized, competency-based assessments that adequately reflect students' language proficiency and provide them with world-language credit and appropriate classroom placement in high school. Adesope, O. O., Lavin, T., Thompson, T., and Ungerleider, C. (2010). A Systematic Review and Meta-Analysis of the Cognitive Correlates of Bilingualism. Review of Educational Research, 80(2), 207-245. Boix Mansilla, V., and Jackson, A. (2011). Educating for global competence: Preparing our youth to engage the world . New York: Asia Society. Center for Applied Linguistics. (2011). Directory of foreign language immersion programs in U.S. schools and growth of language immersion in the U.S., 1971-2011 . Gómez, L., Freeman, D., and Freeman, Y. (2005). Dual Language Education: A Promising 50-50 Model [Abstract]. Bilingual Research Journal, 29(1), 145-164. Lenker, A., and Rhodes, N. (2007). 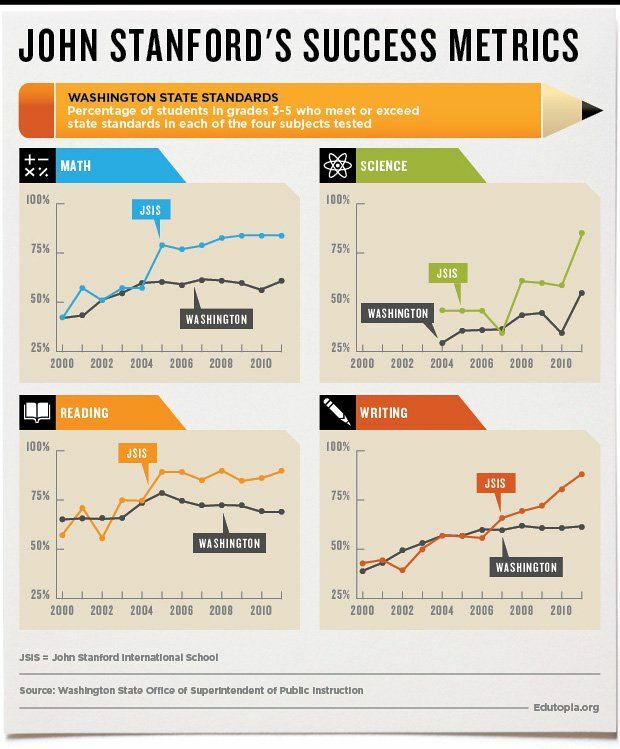 Foreign Language Immersion Programs: Features and Trends Over 35 Years. Center for Applied Linguistics (CAL) Digest. McNeil, N., and Jarvin, L. (2007). When Theories Don't Add Up: Disentangling the Manipulatives Debate [Abstract]. Theory Into Practice, 46(4), 309-316. Palmer, D. K. (2009). Middle-Class English Speakers in a Two-Way Immersion Bilingual Classroom: "Everybody Should Be Listening to Jonathan Right Now" [Abstract]. Teachers of English to Speakers of Other Languages (TESOL) Quarterly, 43(2), 177-202. Thomas, W., and Collier, V. (2002). A National Study of School Effectiveness for Language Minority Students' Long-Term Academic Achievement. Berkeley, CA: Center for Research on Education, Diversity and Excellence (CREDE). Tochon, F. V. (2009). The Key to Global Understanding: World Languages Education -- Why Schools Need to Adapt [Abstract]. Review of Educational Research, 79(2), 650-681. Vars, G., and Beane, J. (2000). Integrative Curriculum in a Standards-Based World . ERIC Digest, 2001-1. Vega, V. (2012). Social and Emotional Learning Research: Evidence-Based Programs. Retrieved from Edutopia.org. Vescio, V., Ross, D., and Adams, A. (2008). A Review of Research on the Impact of Professional Learning Communities on Teaching Practice and Student Learning . Teaching and Teacher Education, 24(1), 80-91. Wiley, B. (2012, September). Schools: Go Global and Prepare Students for Success [webinar]. Asia Society Partnership for Global Learning.